Ten Upper and Middle School French students competed in the State Concours Oral at Arrowhead Union High School on Saturday, May 16. 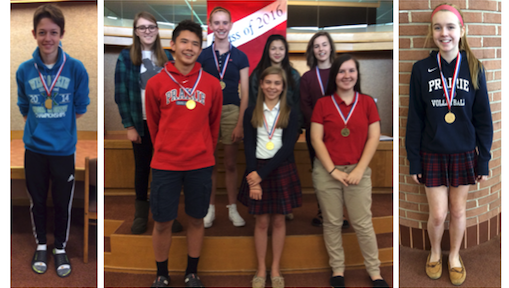 Performing pieces from Reader’s Theater scripts to extemporaneous prose articles to memorized poems, they each came away with a gold medal. The students to be congratulated for building excellent skills include: juniors Maya Dizack, JohnMark Goeke, Michael McGuire, and Allison Mattox; sophomore Emma Nix; freshman Henry Hua; and 8th graders Marielle Banco, Maddi Stevens, Moya Zaleski, and Lauren Zenisek. This entry was posted in All News, Featured, Middle School, Upper School by Communications Department. Bookmark the permalink.